There is a history behind the famous broken papal cross habitually associated with John Paul II who always carried it. Many Catholics are oblivious that it was not JPII, but Paul VI who commissioned it from Italian sculptor Lello Scorzelli in 1963 and used it for the first time December 8, 1965, at the official closing of the Second Vatican Council. But the cross actually dates back much further to Belgian artist Albert Servaes (1883-1966). In 1919, Servaes made 14 charcoal drawings on white paper depicting the stations of the Via Crucis for the monastery chapel of Luithagen. 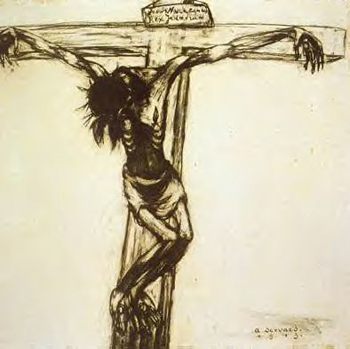 The skeleton figures he sketched, especially the emaciated figure of Christ on the Cross in the 12th station – are pervaded by a dark despair. The contorted figures are supposed to express extreme pain, and in one sense the artist was successful: It is certainly painful for the viewer to see them. These drawings are a clear example of the new school of "Expressionism" applied to sacred art. Servaes was one of the artists of the Laethem School living together in community outside of Ghent in Laethem-Saint-Martin, Flanders. The works of the Laethem School and the Expressionalism it adopted were characterized by pessimism, mystical symbols, a distorted stylization and search for “exotic” primitivism in nature. The Laethem Group, whose best known artist is Gustave de Smet, was animated by a violent reaction against Impressionism, which it felt was too positive and unable to grasp the deep complexities and darkness of the world, which was heading toward the First World War. Rebelling against the decorous and delicate forms of French Impressionism, the Expressionists sought to discover a supposed tragic inner reality of which the artist is the interpreter. Albert Servaes was guided spiritually by Carmelite mentor Fr. Jerome, who initiated him in an occult “mysticism of suffering.” It was under this influence that he sketched the Stations of the Cross for the Luithagen chapel soon after WWI. Servaes’ style became so macabre in his dark Expressionalism that this Way of Cross (1919) drew upon him the condemnation of the Church. Indeed, the condemnation of the Via Crucis of Servaes came straight from the Holy Office, with the direct approval of Pope Benedict XV. This Decretum stands out because it is not just a condemnation of one specific work of Albert Servaes, but the banning of an entire school of art as being opposed to Faith and Tradition. In fact, not only was this condemnation ignored after Vatican II, but the crozier inspired by Servaes became a symbol of the pontificates of Paul VI, John Paul I, John Paul II & Benedict XVII. Francis I was quick to assume this horrific insignia in the first days of his papacy. 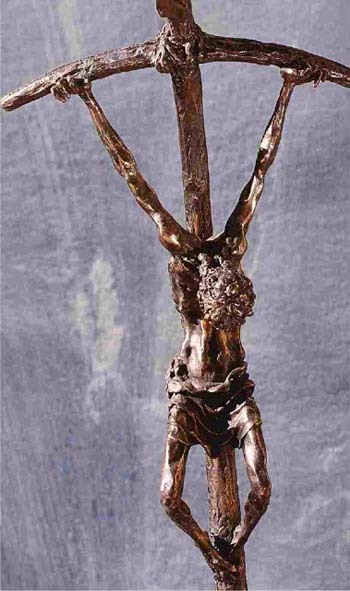 Anyone who looks closely at this gruesome crucifix, with the Christ whose hands look like claws, his legs rudely sprawled open, and his hidden downcast head, can see something devilish in it. It is no wonder the Church solemnly condemned the artist who inspired it. Now, we witness this sad sign of the times: That same cross has been assumed as a symbol of the conciliar Popes in open scorn of the previous condemnation by Benedict XV. Since the papacy of John Paul II, this crucifix has been placed on every papal rosary that is given out. Thus, many unknowing Catholics have become accustomed to this monstrosity, believing it to be acceptable just because it has been approved by the conciliar Popes. In closing, I would like to point out the inaccuracy of some reports made by conservative and traditionalist commentators which assert that Benedict XVI supposedly retired this “broken cross,” Doing so they imply that he did not approve it. 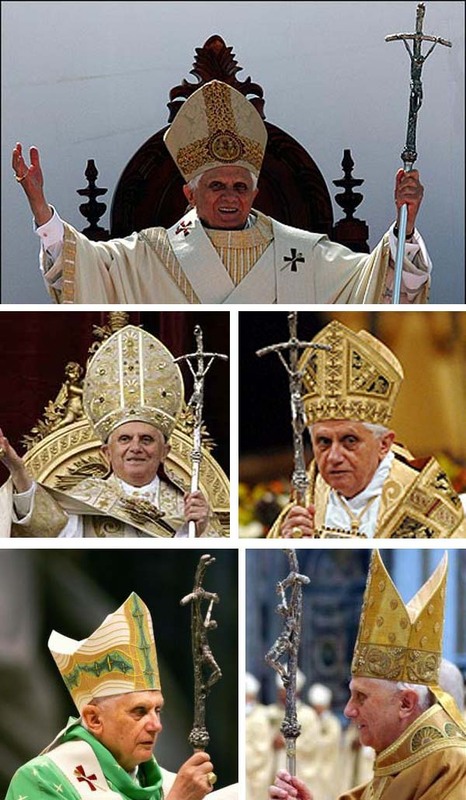 As you can see in the collection of pictures below, Pope Ratzinger definitively did not retire the Scorzelli crucifix, but used it often, thus showing his acceptance and approval of it. During his entire pontificate, it was also on all the papal rosaries that he handed out as gifts. It is an example of the continuity practiced by Benedict XVI, a continuity that is not in an authentic tradition – which condemned this art style – but rather a continuity in error, occult symbols and promotion of modern art. Here we have a good example of where the openness to the modern world preached by Vatican II is leading us: a devilish art invading the Papacy.